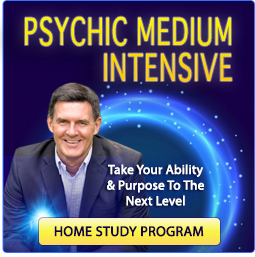 For close to a year I was hearing from psychic mediums and holistic practitioners in the Boston area about an extraordinary psychic medium named Rita. I prefer not to seek out psychic mediums whom I haven’t met, and wait to see if our paths cross without intention. If they contact me on their own, I see that as a sign that they were inspired to do so. I believe that if something is meant to be it will happen without any effort on my part. I purposely did not force a connection with Rita in order to let it happen naturally; that is, at the will of the Powers That Be. That is exactly what happened. As mentioned in a previous chapter, Joe was telling me during a phone conversation about a psychic medium from Boston who draws spirits and spirit-guides, although he couldn’t remember her name. Two days later, Nancy invited me to see a psychic medium demonstration with Brenda on Easter morning, and said that if I needed directions to call the church’s pastor, Rita. Then she added that Rita is the psychic medium who draws people’s spirit-guides. It was then that I knew I was being led to meet Rita, especially when my original Easter plans got canceled. Upon meeting Rita on Easter morning, she was pleased to let me sample her portfolio of “spirit drawings.” She handed me the book and suggested I browse through it back at my seat since the Easter service was about to begin. After Melissa, Deb and I seated ourselves in the back row of the church, we anxiously flipped through Rita’s spirit drawings. As a psychic medium, Rita can see spirits. As an artist, Rita can draw them. Rita’s clients come to her for mediumship readings, spirit drawings or both. Sometimes the spirit Rita sees is a spirit-guide who is watching over and guiding the client from the spirit world. More often, the spirit is a deceased relative or friend who is now in the spirit world, and not necessarily a guide. Rita’s portfolio contained drawings of these spirits and spirit-guides that she had drawn for various clients. Next to each drawing was a photograph of the person Rita had drawn (taken, obviously, while the person was still living here on earth). These were photographs that Rita’s clients had brought back to her after the drawing was done, sometimes years later. Melissa, Deb and I were utterly mesmerized by this tangible display of evidence. These drawings were solid verification that people survive death. If you are wondering if these drawings could be done from the person’s psychic energy that remains here on earth and not their actual spirit, I wondered this myself. However, Rita is also a gifted psychic medium who verbally communicates with these spirits before and during the drawing session, so a conversation between Rita and the spirit is taking place the entire time. Psychic energy holds information, but cannot carry on a conversation. This combination of verbal communication and visual drawing offers convincing evidence that the spirits Rita draws are both present and alive. Most obvious when viewing these spirit drawings were the distinct facial characteristics of each person drawn. When comparing the photograph of the person as they appeared while here on earth to the drawing of that person in the spirit world, there were certain features of each person that jumped off the page. For several drawings, it was the eyes that were unquestionably accurate. For others, it was the hair, the nose, the chin or the mouth—even the ears. Sometimes it was the style of clothing, a favorite piece of jewelry that was always worn, or a hairstyle (like a tight-knit bun or ponytail) that was both in the drawing and photograph. For each drawing in the portfolio, there was at least one or two, and often three or more of these characteristics that screamed, “It’s me coming through. Do you recognize me?” The resemblance is uncanny. In a normal mediumship reading (a verbal reading), the psychic medium will often describe the person (spirit) coming through. They will tell you if the person had bags under their eyes or a scar on their cheek. The psychic medium will mention that the person had big ears or a large nose. Even a mustache or beard will often be indicated. The psychic medium will also tell you what the person is wearing, which will usually be clothing that is typical of their style of dress, like a military uniform or nurse’s attire. Sometimes it is a piece of clothing that the person favored wearing, such as a particular dress, shirt or hat. With spirit drawings, the psychic medium doesn’t have to say it—she draws it. The drawing might not be an identical portrayal of your deceased grandmother, but you’ll know without question that those are your grandmother’s eyes, hairstyle and the necklace she always wore. Basically, the same characteristics that the psychic medium will describe to you verbally are now drawn on a piece of paper. Even when an artist draws a person who is still living, the drawing is not always an exact portrayal. But you know who the person is because the artist captures the most significant attributes of that person’s face. It is a bizarre experience to witness such tangible validation that your deceased loved-one is right there in the room with you. Rita also draws people’s “spirit-guides.” Spirit-guides are souls from the spirit world who watch over us and guide us through life. We may have more than one guide at any one given moment, and they can change as our circumstances and needs change. You might have one guide to help you with your art or writing, while another guide is assisting you with your relationships, health or career. A spirit-guide may be part of your soul group (a family of souls, like a clique, who stick together through several lifetimes), or may be assisting you just this one time as part of their own spiritual work. Regardless, the work they do helping you is as beneficial to their own spiritual growth as it is yours. We might know a spirit-guide from this lifetime, but not necessarily. A spirit-guide may be someone we know from another lifetime, or know only from our time in the spirit world. The assistance of our spirit-guides may never be completely known or understood while we are here on earth, but their help to us is invaluable. Many people enjoy knowing what their spirit-guide looks like, and some believe that their drawing brings them closer to that guide. Whatever your beliefs, Rita has been quite successful drawing spirit-guides, and many of her clients have raved to me about the personal and spiritual benefits they received from this gifted service. After the Easter service, I was so intrigued by Rita’s drawings that I had to experience this for myself. So I called Rita about a week later to set up an appointment. When Melissa and I arrived at the appointment, I was filled with anticipation for what was to come. We had gotten lost trying to find the church, so we were late and I was full of anxiety as a result. Rita was unaffected by our late arrival and helped us to relax with her calm and peaceful manner. She got us something to drink and talked with us for a few minutes before beginning the drawing session. I was curious how Rita got started as a “spirit artist,” so I asked her how she came to discover her gift. Interestingly, Rita wanted to be a painter, not a spirit artist. But in 1984, Rita’s friend asked her to come to a psychic development class. Rita wasn’t interested in the class, so her friend offered to pay the workshop fee if Rita would go with her. Rita gave in and agreed to go for her friend’s sake. One day, the psychic development class was studying something called transfiguration, where a spirit’s facial form will appear in front of the face of someone in the room. Even though anyone can see the form, not just psychic mediums, the teacher had tried photographing these forms without success. Rita told the teacher, “Well, if I can see it, then I can draw it.” The teacher had Rita try drawing these spirits who appeared and suddenly people began recognizing the spirit she was drawing. Having known about a famous spirit artist named Coral Polge from London, England, the teacher predicted that Rita would be a spirit artist like Polge one day. Before this day, Rita had never heard of Polge or even heard of a spirit artist. A short time later, Rita’s teacher, Barbara Fairwell, encouraged Rita to do her spirit drawings for a small group of church members in Swampscott, Massachusetts. Rita was nervous and unsure. One of the first spirits who came through was a young adolescent boy. After Rita drew the boy, one man became visibly emotional. He reached into his wallet and pulled out a picture of the same boy Rita had drawn. It was his son who had died in an automobile accident. The boy was coming through for his father in Rita’s drawing. That was Rita’s discerning point of no return. She saw the validation her drawing brought to the man—a knowing that his son was okay and still with him—and she witnessed the peace the drawing had given him. “I asked for a volunteer to come forward who would like a spirit drawing done. A very blond, blue-eyed man stepped forward and I began to draw. The drawing was of a Native American man who I assumed was a spirit-guide. I kept hearing a verbal message, "As the crow flies.” As it turned out, the drawing was of his grandfather, whom he had recently visited before his passing. “The man told me that before his grandfather’s death, his grandfather had warned him about his lack of caring for his physical health and that he needed to see "how the crow flies." Then he gave him a pendant of the crow. By the time that demonstration was over, people were so emotionally affected by her drawings that Rita was indelibly hooked as a spirit artist, and her reputation began to fly. During my own spirit drawing, Rita began by raising her energy in a short meditation to link with spirit. She held my hands as we sat in silence for only a few minutes. Then she started to explain who was coming through. Before I present a transcribed account of the first ten minutes of my reading and drawing with Rita (I videotaped it), I first want to remind you that my readings with psychic mediums at this time in my research were slightly different than what most people experience. First, psychic mediums no longer needed to give me messages of verification, that is, messages that would help prove to me that the psychic medium is actually communicating with spirit. I was already a “knower,” and Rita understood this. This saved Rita the time it normally took to communicate names, dates and other details about my life (that she could never know) in order to plow through my skepticism. Second, I had basically come this day to experience Rita’s spirit artistry, not her mediumship. I already knew she was a gifted psychic medium based on the testimonials of other gifted psychic mediums that I knew and trusted. The fact that I also got some verbal messages during Rita’s drawing was simply a bonus. Of course, I received messages during my drawing, too, but I am sharing this beginning section of my experience with you so you will get a sense of what it is like as Rita initially connects with the spirits who are present. The following transcription is of Rita’s voice only. Melissa and I were both in the room with her that day and said a few things now and then (although not much), but I have omitted anything we said to keep this brief. My personal comments to you about this reading are set in [brackets]. Okay, I see a gentleman coming in for you. The gentleman had a mustache. The gentleman had silver colored hair—beautiful hair—silver colored hair, longer than yours. I don’t believe this is your father, I believe I’m going back [farther in time]. This man has been superimposed over your face a lot of the time we have been sitting here. He passed with a condition of the chest and… Now there is another gentleman coming in and I’m feeling as though this one is probably your father. As I’m feeling him, his face is rounder than yours. And as I’m feeling him, there is a soulfullness to his eyes, there is an intensity to his eyes. Oooh, he is taking over [Rita took a deep breath and fanned herself with her hand. This spirit’s energy took her breath away]. As I’m feeling him, his hairline has receded [True, if it is my father]. And as I’m feeling him, he carried a little bit of weight in the front of him [True, as he got older]. And as I’m feeling him, he was a little bit of a bully… Oh wait, he just backed up as I said that. He didn’t think of himself that way. Anytime you don’t understand what I’m saying, you can say something. Okay, he’s coming through with an energy as though he is tough [True, which is why she interpreted that as bullyish]. There is also a woman here. I’ll go back to your father in a moment, but I saw this woman the very first time I saw you [on Easter Sunday], and she’s right back here now. She’s showing herself to me as a moderate height woman [Rita laughed as she indicated with her hand that moderate height to this spirit meant to about Rita’s forehead, which is rather short]. The hair is curled fairly close to the head—it looks like a perm—she feels very grandmotherly. She’s a cute little lady, with a great big smile on her face. She’s very loving, very caring, very cookie-giving, very sweet, gentle… and a condition of the chest took her to the higher side of life as well; I felt, suddenly, like I couldn’t catch my breath. As I’m feeling her, I’m feeling that she was just an absolute love. I get the sense that when she would call your name, her voice would go higher [True]. She had one of those voices that would go a little more soprano as she would call your name out the door. As I’m feeling her, I feel like she wants to give you a big glass of cold milk and some cookies—this is the kind of vibration that she comes in with [this is probably typical of most grandmothers, but it most definitely is typical of mine]. So she just comes in with a tremendous amount of love and a tremendous amount of caring. So she is here with you also. So you have three people here, okay? He came in strongly with a large handlebar mustache. He might be a great grandfather. A haircut that was cut longer than normal for today, like what I would imagine a riverboat person would look like, although he’s not a riverboat person. He just had a big mustache and the longer hair. He’s a handsome, very good-looking man. He was standing very straight and very proud of himself. [I had a great-great grandfather who was in the Vermont Calvary and looked exactly the way Rita had described in pictures I have seen of him]. I don’t feel like he’s a guide—although guides do come through—I feel like he’s a loved-one. Okay, I’m going to start to draw…[and Rita started her spirit drawing]. I expected Rita would draw my father because he had come through in every reading I had ever had with a psychic medium in over two years. Surprisingly, however, it was my two grandmothers who were the first to arrive for the drawing. In fact, they were almost fighting over who was going to be drawn. Rita said they were almost what she calls “dueling grandmothers,” although she has witnessed much worse behavior than that of my grandmothers on this day. I was very close to my grandmother on my father’s side (paternal), but my grandmother on my mother’s side (maternal) died when my mother was a young girl. To make matters confusing, both grandmothers shared the name Mary. Whenever a psychic medium would tell me that my grandmother, Mary, was coming through to them, I usually assumed it was the grandmother I knew (paternal). But Rita quickly discovered that my maternal grandmother had a strong presence this day with me as well. I was pleased to know she showed up. And now I wondered how many other readings I had received where she was present and I wrongly assumed it was my paternal grandmother. I began feeling a bit guilty for my unintentional favoritism. As Rita started to draw, she began drawing my maternal grandmother. It was evident by the full cheeks she had drawn. The grandmother I had known, my Dad’s mom, had a thinner face. I had secretly brought a photograph of my maternal grandmother in an envelope intending to show it to Rita after the drawing if this grandmother came through. Then, suddenly, my other grandmother, my father’s mother, pushed her energy toward Rita. And getting two drawings was probably the best way to handle it. That way both grandmothers could come through without any hard feelings, and no competition between them. But did I let that happen? No, of course not. When Rita was done drawing my paternal grandmother, and it was my maternal grandmother’s turn, I asked Rita if she could try drawing my father instead. I thought it would be a nice gift for my mother. There are several things wrong with this situation. One, just as you can’t ask a psychic medium to connect with a particular spirit, you can’t tell a spirit artist which spirit you want her to draw. It doesn’t work that way. The psychic medium or spirit artist simply links with spirit, and whoever is there is who you get. This is why Rita couldn’t control which grandmother she was drawing. She had to wait until they fought it out and decided amongst themselves. Two, when you try to mess with this system by controlling the outcome, spirit messes with your head. In other words, by asking Rita to draw my father instead of my maternal grandmother—who so patiently waited her turn—I was trying to control the outcome. I was also probably insulting my grandmother, which isn’t very nice. I have apologized to her. Nonetheless, the joke was on me in the end. Rita told me right off that she couldn’t promise if my father would come through, but she would give it an effort. He had come through in the beginning of the session with verbal messages, so she expected she would be able to draw him. She began by describing him verbally, and it sounded like she was describing my father. But when she began the drawing, I knew it wasn’t my Dad. And I had no idea who this guy was on her drawing pad. The interesting part is that it wasn’t like Rita’s drawing looked a little like my father. This was clearly not my father in any way. Still, it was definitely someone. The drawing of this man looked so real that it was spooky. Rita’s drawing pad showed a soul presence, an energy that revealed the essence of a real person. Everyone who looks at it agrees. This was not a poor drawing of my father; it was an awesome drawing of someone unknown to me. And the mystery of this spirit’s identity drove me nuts. I hoped that when I showed it to my mother, she would know who it was. I joked around with the possibility that she might yell, “Oh my God, that’s your father!” And as I gazed at her with a confused look on my face, she would add, “No, I mean it’s your real father!” Sure, that would be an awful bomb to drop on me after thirty-eight years, but what a great story that would have made for this book. Still, no such luck. It turns out that the drawing is of my paternal great-uncle. It took my relative’s family photo albums to figure it out. I’m really happy that my great-uncle came through, but it doesn’t have the impact and surprise of the secret father story I dreamed up. I didn’t know my great-uncle, so the drawing of him didn’t evoke an emotional response from me. But the drawing Rita did of my grandmother was much more emotional than I had anticipated. Since I was used to getting readings from psychic mediums, I rarely got emotional the way I once had when I was new to mediumship. However, seeing my grandmother’s face appear on Rita’s drawing pad was an especially touching experience. Of course, Rita was also offering me verbal messages from my grandmother, so the combination of verbal communication and visual validation added extra sentiment to the experience. It was a special bonus to be able to walk away from that reading with something as concrete as this drawing to share with my friends and family members. In my grandmother’s case, it was the eyes that were the first identifying marker. My grandmother had markings under her eyes that were unique, and Rita’s drawing made me feel as if my grandmother was looking straight at me. Rita also perfectly matched the hair, mouth and even the dress style (if not an exact dress she used to wear). Plus, Rita was able to verbally describe my grandmother’s sallow skin, her brownish hazel eyes, her slightly crooked nose, and her “home perm”—all details that she made sure to describe in words in case her chalks could not properly duplicate the color, shape or texture. Although the drawing had my other grandmother’s full cheeks (because Rita began drawing her first), there was no question about who Rita had finished drawing. It actually made the drawing more interesting to have a hint of my Mom’s mom in there, too. And it certainly made the story that accompanies the drawing more interesting. Rita is a gifted psychic medium who doesn’t need her drawings to alter one’s life with her readings. Her gift of spirit communication alone can change the course of one’s life. I know the messages she gave to me from my grandmother were as valuable as the picture she drew. And being a counselor, Rita is professionally capable of dealing with the many issues that may come up during a reading, bereavement issues being just one. Still, it is Rita’s spirit artistry that clearly sets her gift apart from other psychic mediums, and allows her to give something extra to her clients. Just when I thought I had seen it all, the Universe opened my eyes to new possibilities, once again. 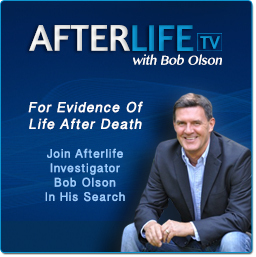 BOB OLSON is a former private investigator and skeptic who began using his investigation skills to research psychics, psychic mediums and the afterlife in 1999. This research led him to establish www. OfSpirit.com Magazine (2000), www.AfterlifeTV.com (2011), www. BestPsychicMediums.com (2001) and www. 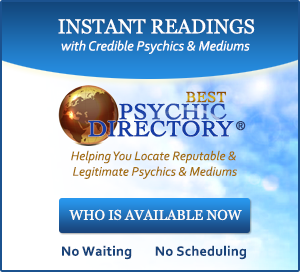 BestPsychicDirectory.com(2007), three of the most trusted and influential sources for understanding and locating trustworthy psychics and psychic mediums. 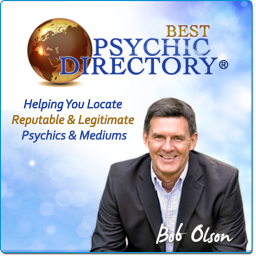 Today Bob Olson has tested hundreds of psychics and psychic mediums around the world and has become a leading authority on the subject with TV, movie and documentary producers, journalists, book publishers, event promoters, as well as law enforcement agencies and private investigators. 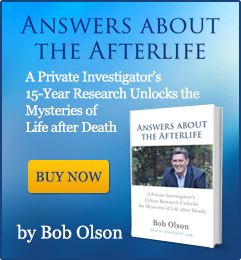 Bob’s achievements in psychic and psychic medium investigation and testing has further allowed him to evaluate and isolate the key components that set apart the best psychic medium readings from the mediocre—leading him to create his famous (although secret) 15-point test. Bob has documented his findings in a multitude of articles. He has authored the Forewords for three books: The Complete Idiot's Guide To Communicating With Spirits, Consult Your Inner Psychic and The Complete Idiot's Guide To Divining The Future. Bob has also been quoted as an expert in How To Get A Good Reading By A Psychic Medium and Empowering Your Life With Angels.